Cigarette smoke contains cancer-causing substances called carcinogens. 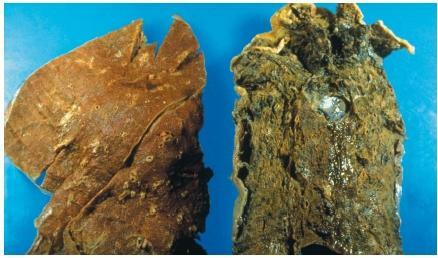 Cigarette smoking is the major cause of lung cancer and emphysema (a serious disease of the lungs). People who smoke are also at increased risk for developing other cancers, heart disease, and chronic lung ailments. In the United States alone, cigarette smoking is responsible for almost 500,000 premature deaths per year. Cigarette smoke is called mainstream smoke when it is inhaled directly from a cigarette. Sidestream smoke is smoke that is emitted from a burning cigarette and exhaled from a smoker's lungs. Sidestream smoke is also called environmental tobacco smoke or secondhand smoke. Passive smoking, or the inhaling of secondhand smoke by nonsmokers, is believed to be responsible for about 3,000 lung cancer deaths per year. Nonsmokers exposed to secondhand smoke also have a greater chance of suffering from respiratory disorders. Over 4,000 different chemicals are present in cigarette smoke. Many of these are carcinogenic, or capable of causing changes in the genetic material of cells that can lead to cancer. Cigarette smoke contains nicotine, an addictive chemical, and carcinogenic tars. In addition, smoking produces carbon monoxide, which has the effect of decreasing the amount of oxygen in the blood. When cigarette smoke is inhaled, the chemicals contained in it are quickly absorbed by the lungs and released into the bloodstream. From the blood, these chemicals pass into the brain, heart, kidneys, liver, lungs, gastrointestinal tract, muscle, and fat tissue. In pregnant women, cigarette smoke crosses the placenta and may affect development of the fetus. There is a strong relationship between the length of time a person smokes, the number of cigarettes a person smokes each day, and the development of smoking-related diseases. Simply put, the more one smokes, the more one is likely to suffer ill effects. Cigarette smoke weakens blood vessel walls and increases the level of cholesterol in the blood, which can lead to atherosclerosis (a disease in which fatty material is deposited in the arterial walls). It can cause the coronary arteries to narrow, increasing the risk of heart attack due to impaired blood flow to the heart. Smoking also increases the risk of stroke (a blood clot or rupture in an artery of the brain). In addition to lung cancer, smoking can cause cancers of the mouth, throat, voicebox, esophagus, stomach, cervix, and bladder. Drinking alcohol while smoking causes 75 percent of all mouth and throat cancers. People who have a tendency to develop cancer because of hereditary factors may develop the disease more quickly if they smoke. Smoking is the leading cause of lung disease in the United States and results in deaths from pneumonia, influenza, bronchitis, emphysema, and chronic airway obstruction. Smoking increases mucus production in the lungs and destroys cilia, the tiny hairlike structures that normally sweep debris out of the lungs. The nicotine in cigarette smoke causes the release of a chemical in the brain called dopamine. When the level of dopamine in the brain is increased, a person experiences feelings of extreme pleasure and contentment. In order to sustain these feelings, the level of nicotine in the body must remain constant; a smoker becomes dependent on the good feelings caused by the release of dopamine and thus becomes addicted to nicotine. Addiction: Compulsive use of a habit-forming substance. Carcinogen: Any substance that is capable of causing cancer. Dopamine: A chemical in the brain that is associated with feelings of pleasure. Nicotine: A poisonous chemical that is the addictive substance in cigarettes. Secondhand smoke: The smoke emitted from a burning cigarette and exhaled from a smoker's lungs. nicee!!!! this would stop anyone from smoking. if people are easily grossed out, lol. Extremely well written article, should try and get it published else where aswell. reading such articles gives me sheer satisfaction since i am a person completely against smoking. why is carbon monoxide present in cigarette smoke. heyyy i like this website. it is very helpful. my friend is trying to do a project on smoking and this helps very much. thank you! I dropped cigarettes the same day I received my electronic cigarette. Yes it still has nicotine in it, but it does not have all of those other harmful chemicals. I have cut down to using it mainly in the evening and use less than 0.4 ml of the liquid in any given day. I was told that an average smoker uses 2.0 to 4.0 ml per day. The liquid comes in flavors that taste better than cigarettes and in different levels of nicotine so I can step down. I started at a low level (18 mg), since I smoked ultra lights at the time. I will buy the next level down in a month and then the following month I will be at zero nicotine. My question in all of this, is whether or not the inhalation of this water vapor (it is made with vegetable glycerine and water) with the nicotine intertwined is still harming my lungs? Is this nicotine causing my cilia to lie down when I inhale? The research I have done indicates that the nicotine is released immediately into your bloodstream as soon as it hits your mouth and throat. I am told that I am not to hold the vapor in for any length of time for this very reason. If I hold the vapor in it would not give me any more nicotine. SO I wonder if I am in fact not doing any damage to my lungs at all??? Its very good but if we smoke a cigratte per day is it harmful for us...? I am 23 and smoking since last 4 years. In college to attract the attention and to feel mature I started this,but how it became my habit,I don't know. I smoke 10 cigareete /day on average. how likely I am prone to disease and how can I quit smoking . can a smoker pass chemicals from there mouth when kissing a non smoker? Wow this helped a lot with my chemistry homework! I will definitely come back!